So day two of the "Stay-cation" did not really turn out as I had planned. I had my list and was so excited to check a bunch of other projects off it until I woke up at 4 am with a desperate need to visit the Porcelain God. Not sure if it was something I ate or a passing bug but Day 2 led me to my bed for the day. I am so grateful for my Hubby who got the girl ready and for my Mom who spent the day with her and then sent her home with dinner for me and the Mr. There is something about the flu that literally brings you to your knees (Haha, I totally didn't mean to make that sound as gross as it does...but you know what I am saying). Once I got over the frustration of getting nothing done I set myself up in my bed, took lots of naps and caught up on some of my favourite blogs. Along the way I visited these great blogs who had featured my play kitchen. I wanted to say a huge thank you to the below bloggers for featuring The Boss' play kitchen on their blogs. Kristen @ Ladybug Blessings, with "Handmade Tuesdays" featured the Kitchen here. Maryann @ Domestically Speaking, hosts a Power of Paint Party and featured the kitchen on her POPP feature here. 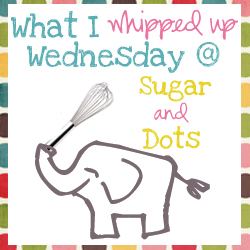 And Kimmie at Sugar and Dots, for featuring the Kitchen here during "What I whipped up Wednesday". These three ladies all have beautiful blogs, and I am so honoured to be featured amongst all the other amazing DIY's. Make sure if you have a cute project you head over to these blogs and link it up so we can all see your great work, and share the love!